"Bringing out the chef in all of us..."
Farm raised quail products. Free of antibiotics and hormones. 3 to 4 times the nutritional value of regular chicken eggs. Quail eggs are considered a delicacy in many countries, including western Europe and North America. These make great party appetizers! Check our recipes for great ideas! One of our tastiest treats! 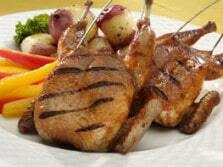 Choose from a selection of bone-in quail, boneless quail, quail halves, and more. Check out some of our customers favorite t shirts and more. 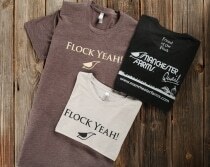 Show your quail pride! Learn what makes quail from Manchester Farms great for your family. 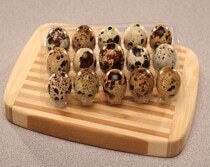 Learn what makes quail eggs a healthy alternative to chicken eggs. At Manchester Farms, we pride ourselves on raising happy, healthy quail, providing value and excellent service to our customers, and continuing our legacy as a second generation family farm. Started in the 1970s, Manchester Farms is the oldest quail farm in the nation. Whether you’re looking for quail for the dinner table or for commercial food service, Manchester Farms offers a number of unique products to meet your needs including bone-in quail, semi-boneless, quail eggs, and bacon-wrapped quail. Our birds are raised with the best care and are hormone and growth promotant free. If you’re unsure how to cook quail, we have a number of fantastic quail recipes from our family and our chef friends. We hope you enjoy! At Manchester Farms our mission is to provide high quality food products of value to our customers, consistent supply, and exceptional customer service. 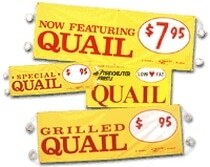 We are the Only SQF Level 2 Certified Quail Processor in the U.S.A. Whether you need quail for commercial food service or retail we provide the premier quail products including bone in quail, semi-boneless quail, Quail eggs, and bacon wrapped quail that sure to please. Try any of our premium quail appetizers, bone in quail, or boneless quail and see just how delicious and healthy quail and quail eggs can be for you and your family. Not sure how to prepare quail? Try one of our great quail recipes.